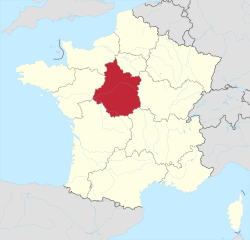 Centre-Val de Loire (French pronunciation: ​[sɑ̃tʁ]) is ane o the 18 regions o Fraunce, locatit towards the northwest o the actual centre o the kintra, aroond the Loire Valley, the Val-de-Loire. Its caipital is Orléans, although its lairgest ceety is Tours. The main featur o Centre is the Loire Valley. It includes the rich, fertile valleys o the Loire River an its tributaries: Cher, Indre, Loiret, etc. Centre contains the famous châteaux o the Loire Valley, which attract mony tourists tae the region. The climate o the region is essentially oceanic. The name Centre wis chosen bi the French central govrenment based purely on geography, as Centre is composed o too mony historical provinces tae uise a historical name. Housomeivver, Centre is no in the geographical centre o Fraunce, an the name haes been criticized as being owerly dull an nondescript. It haes been proposed tae rename the region Val de Loire (i.e. "Valley o the Loire") or an aw "Coeur de Loire" (i.e. "Hert o Loire), which wad give mair character tae the name o the region. Val de Loire is a name associatit wi positive images o the Loire Valley, such as the chateaux, the gentle an refined lifestyle, wine, the mild an temperate climate. The name chynge haes been adoptit. This page wis last eeditit on 23 Mairch 2016, at 23:51.